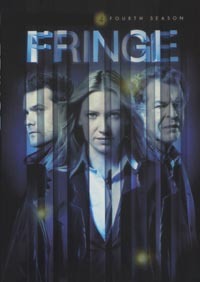 17 Everything in Its Right Place - Lincoln, feeling out of place on the team now that Peter is back and Olivia is beginning to forget him, volunteers to take liaison duty for the day, and joins the alternate Fringe team in the search for a vigilante killer with some unusual abilities. He bonds with Fauxlivia and Alt-Astrid, and he and Alt-Lincoln compare life stories to figure out the way in which their two lives diverged, only to find that they're not so different as they initially seem to be. Alt-Lincoln still suspects that there may be a mole in his team working for David Robert Jones. 18 The Consultant - When both of the two identities of people from the separate worlds experience the same catastrophes from incidents in just one world, the two Fringe teams collaborate. Walter crosses over to find that Jones is behind the phenomena, but to what ends? Also, the investigation into the Fringe-mole continues. 19 Letters of Transit - In the future, the Observers rule and humans that survived the purge serve them. There are still a small number of people fighting for the resistance, and one of them has discovered one of the original Fringe team in the form of Walter protected in amber. As the resistance attempts to get rid of the Observers, we get a glimpse into a rather dark dystopian future. 20 Worlds Apart - Multiple earthquakes are happening simultaneously around both our world and the alt-world. Walter believes he knows what the end game of David Robert Jones is. And, even though Olivia has a connection to one of the players Jones is using that she thinks she can utilize, in the end it leads to some hard decisions for the Fringe team. 21 Brave New World: Part 1 - In the first of a two part season finale, a mysterious Fringe event causing people to spontaneously combust forces Walter to revisit his painful past, while the Fringe team faces off against David Robert Jones to save the world, or worlds.